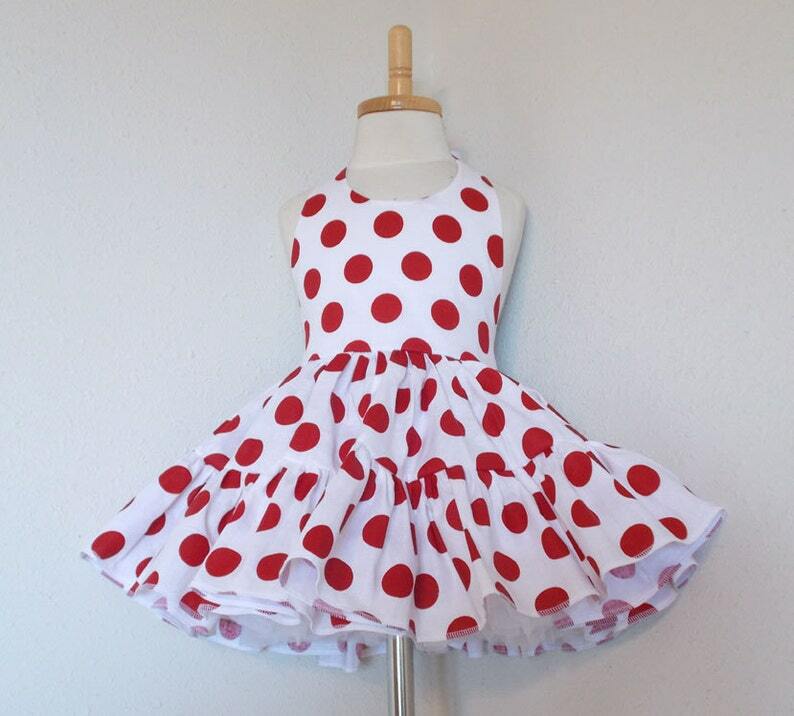 This pretty sundress has a white with big red polka dot halter top attached to a very full ruffled two tier polka dot twirly skirt. 100% cotton dress has ribbon ties at neck and elastic at back waist. Skirt is made extra full for little girl's twirling fun. Also available in hot pink/white big dot, lime/white big dot, black/white big dot, purple/white big dot, red/white big dot, pink/white, lilac/white, and yellow/white big dot. For a special touch this item can be monogrammed for no extra charge. Just let us know Initials at checkout. First Initial/Last Initial/Middle Initial. Or you can choose to have a Single initial in Applique. This sweet dress can be custom made with different color/print ruffles, and halter top. Let us know what you would like! 3-6 Month - Chest 19-20" - Waist 19-20" - Skirt Length (waist to hem) 8"
Skirt Length (waist to hem) 9"
12-18 Month - Chest 20-21" - Waist 20-21" - Skirt Length (waist to hem) 10"
18-24 Month - Chest 21-22" - Waist 21-22" - Skirt Length (waist to hem) 12"
2T - Chest 21-22" - Waist 21-22" - Skirt Length (waist to hem) 12.5"
3T- Chest 22-23" - Waist 22-23" - Skirt Length (waist to hem) 12.75"
4T - Chest 22.5-23.5" - Waist 22.5-23.5" - Skirt Length (waist to hem) 13"
5 - Chest 24-25" - Waist 24-25" - Skirt Length (waist to hem) 14"
6 - Chest 24-25" - Waist 24-25" - Skirt Length (waist to hem) 14.5"
7 - Chest 25-27" - Waist 25-27" - Skirt Length (waist to hem) 15"
8 - Chest 25-27" - Waist 25-27" - Skirt Length (waist to hem) 15.5"
10 - Chest 26-27" - Waist 26-27" - Skirt Length (waist to hem) 15.5"
12 - Chest 27-28" - Waist 26-27" - Skirt Length (waist to hem) 16"
14 - Chest 28-30" - Waist 28-30" - Skirt Length (waist to hem) 16.5"
16 - Chest 29-31" - Waist 28-30" - Skirt Length (waist to hem) 17"
LOVED the dress! It was so full and even more amazing with the poofy skirt underneath! My daughter absolutely loved wearing it and twirled all night in it! The seller was VERY accommodating and a pleasure to work with! Highly recommend!! !